Home > Blog > My Partner is Stealing Money/Ruining Our Business, Now What? There is almost nothing worse than the feeling that those you should be able to trust most are taking advantage of that trust. Yet, it happens–in family relationships, social relationships, and in business. What should you do if you believe your business partner is stealing money from your business? This type of illegal business conduct (i.e., fraud, embezzlement, breaches of fiduciary obligations, theft) are legitimate concerns and should be addressed right away. Burying your head in the sand pretending it will go away on its own will only make matters worse. So, what do you do if you suspect your business partner is surreptitiously removing money from company accounts or is taking business property/assets for his personal use instead of for the benefit of the business? The first thing to do is remain level-headed. It is far too easy to let emotion and anger rule the day when that will only detract from resolving the situation. After all, you entered into the business relationship because you trusted this person and believed your partner would never take advantage of you. . . right? You are justified in feeling betrayed and angry, however, you must remain calm because this situation will likely only get more stressful in the ensuing weeks and months while you work towards resolving the situation. You need to make sure the partner is actually stealing from the business. This is done through gathering evidence. A ‘”mere suspicion” that your partner is stealing from the business is not sufficient to prove in court he is committing fraud or embezzling business money/assets. Many client are absolutely convinced their partner is stealing from them. When I ask them how they know this, they often tell me it is just a feeling in their gut or just because of the way their partner is acting. In many of those situations, I suspect my client is probably correct. However, they cannot prove their case through a gut feeling. You must gather actual evidence of the theft through bank statements, bookkeeping records, credit card statements, receipts, inventory accounts, ATM withdrawals, etc. Keep meticulous business records of inventory, cash, and all transactions. Put tight controls on the business cash and assets. Require all purchases/expenses be matched with a legitimate receipt (i.e., one containing a business logo/name/address). Remove any unnecessary signers from accounts and limit access to cash and inventory to only those who genuinely need it to run the business. Put safeguards in place that prevent any partner from unilateral access to cash and assets (i.e., dual keys to a safe box; dual keys to inventory and the business premises; dual signatures on accounts). To the extent money and inventory is gathered/handled at the business, consider installing video cameras as an added layer of protection to oversee who is handling the money and inventory. Keep copies of all of these records. If your partner is stealing money or assets from the business, the records will reveal it. 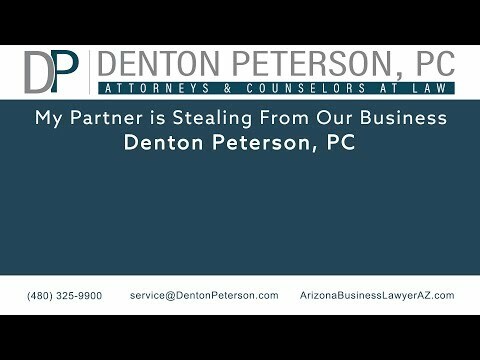 My Partner is Stealing From Our Business | Denton Peterson, P.C. If you partner is stealing company cash/assets, you likely have several remedies, which may include filing a lawsuit against your partner for fraud, breach of fiduciary duties, or breach of contract. The lawsuit will often include a request for an injunction against your partner (to prevent that partner from having further access to company funds or assets) and may include a request to dissolve the company. If the illegal conduct of your partner is serious enough, it may justify a criminal complaint against your partner for criminal fraud, embezzlement, or theft. In extreme cases, you may be entitled to self-help remedies that allow you to take steps of securing company cash and assets to prevent further embezzlement or fraud. You should be very cautious in implementing self-help remedies because, if not done correctly, it may look to the court like you are the one harming the business or your partner. You should employ self-help remedies only under the direction of an attorney where you can meticulously track each step you take to avoid any potential mistakes that could come back and haunt you in this process. The company Operating Agreement, Bylaws and state or federal statutes will often dictate what each partner can and cannot do in these types of business disputes and what remedies are available in terms of a lawsuit, arbitration, and damages. The provisions in the Operating Agreement, Bylaws and statutes can be somewhat complex so it is best to consult with an attorney who has experience in these type of business disputes—your options can be multi-layered and you need an experienced attorney familiar with this area of law to be able to recognize the potential pitfalls that will inevitably arise. It is best to consult with an attorney at the very beginning of your suspicions because these business partner disputes can blow-up into something much larger than they should if they are addressed immediately. Waiting months in hopes that “things will just work out” will only make the situation worse, and may even render the company incapable of being salvaged due to the sustained fraud/embezzlement. At Denton Peterson, P.C. we have attorneys with many years of experience in handling these type of situations (often called “business divorces”) and would be happy to sit down with you to assess your specific situation. We can provide you with an evaluation of your best options given your current circumstances.